This is a short story (15,000 words or 50 pages) intended for readers of the Elder Races who enjoy Liam Cuelebre as a character. 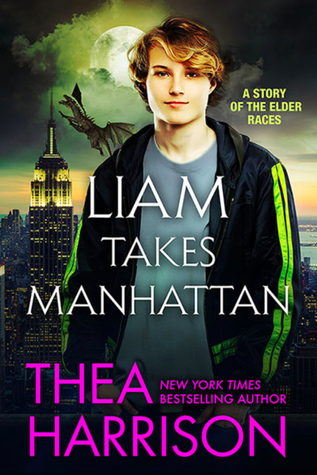 LIAM TAKES MANHATTAN is the third part of a three-story series about Pia, Dragos, and their son, Liam. Each story stands alone, but fans might want to read all three: DRAGOS GOES TO WASHINGTON, PIA DOES HOLLYWOOD, and LIAM TAKES MANHATTAN. This is a pretty short novella, I definitely wanted more from this story; mostly because I love this family so much! We were there when Liam was conceived to his birth, to his first day of school, his first shift, his first crush; our baby is growing up too damn fast.. Literally. Liam is technically only about a year old but he grows in leaps and bounds and is now closer to a 19 year old in temperament and appearance. Liam makes a decision that will take him far from home and outside of Dragos and Pia’s purview which i’m sad about but I guess I understand. There isn’t a whole lot a can say about the story without spoilers especially since it’s so short. I can say, I enjoyed the read and the quick look into one of my favorite fictional families lives, but at the end I think I was left a little disappointed that it didnt give us more. Im going to assume that Thea Harrison has some awesome plans and roll with it.